Whir. Scrape. Swipe. Your mouth agape, you anxiously await the next moment you will be granted permission to swallow. The smell of rubber gloves pervades the sterile ambiance as you glance up, temporarily blinded by a bright light from above, just before a masked figure wielding metal tools looms over you. The scene sounds a bit like something out of a horror show, but in reality, it’s just a visit to the dentist. However, for some people this very scenario induces horror—a horror so great that they would rather skip professional dental care altogether. Dental phobias, for afflicted individuals, are a reflex—a response of their body that tells them something just isn’t right. While these individuals may have no control over their dental fears, the fears are important to overcome due to the heavy impact on dental health and general well-being. If you suffer from dental fears, you don’t have to hide from the dentist until your teeth fall out. Many family dentistry experts are finding ways to treat even the most frightened patients. Fear of the dentist is technically termed “dentophobia” or “odontophobia”—words which mean that afflicted individuals find a visit to the dentist to be just about the worst thing in the world. According to dental experts, dentophobics experience a physical reaction—an internal fight-or-flight response—that makes it impossible for them to sit in the dentist’s chair, much less open wide for a check-up and cleaning. More and more dentists are turning their practices into a safe haven for dentophobics, offering dental services that include sedation or complete anesthesia and an environment that is gentle and relaxing, more like a spa. One dentist in New York uses his skills and expertise in dentistry to specialize in helping people who have extreme dental phobias. He has worked with a variety of dentophobics—some whose dental fears can be traced back to a traumatic experience in childhood or a dental procedure gone awry due to improper anesthetization. For others, the fear may be related to a discomfort, such as difficulty breathing during dental work. Whatever the reason for their dental fears, they still need routine dental care. Since many of these patients go years between appointments, their check-ups are generally more extensive than would normally be necessary, thereby exacerbating the issue. 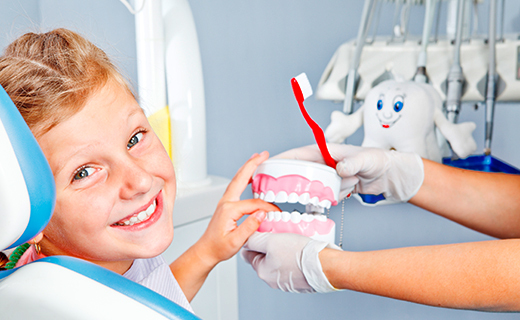 In an effort to help each patient achieve and maintain optimal oral health, dental experts turn to a few time-tested “tips and tricks” to get their patients into the office and ultimately through their dental check-up. To truly reduce your fear, practice prevention. The more diligently you practice proper dental care throughout the year, including bi-annual check-ups with your family dentistry team, the less “scary” your dental appointments will be. Great practice! Very good explanations of what they are doing each step of the way, very attentive to any pain, friendly, warm, and all have a great sense of humor! Excellent service; appt. was on time; cleaning was thorough and professional.